There are many dishes that I have been making on quite a regular basis but never get the chance of posting it. The main reason being most of the rich, not so ordinary dishes are prepared for dinner or for parties. I like to do things on my own pace and the perfectionist I am I always prefer dinner parties so that everything is done and arranged way before the guests arrive. Unless it’s a potluck or some 3rd party caters the food, afternoon get together is not very common in our household. So though the makhani chicken, dhokar dalna, za’atar focaccia, mutton curry is being made and enjoyed almost regularly but they never get the chance to appear on the blog. But now the scene is a little different. Sonny boy has started pre-school (the second one) school and the school authority prefers home cooked snacks for the kids. It’s almost difficult to prepare something fresh and filling every morning so I have resorted to breads. With freshly baked breads the options are endless. Make French toast, sandwich with different fillings, bread pakoda, vegetable gold coin or mini pizza, healthy tasty snack is prepared in minutes. Last week again made za’atar focaccia which sonny boy loves as sandwich with a piece of cheese slice and little butter, rest we enjoyed with some hot lentil soup. 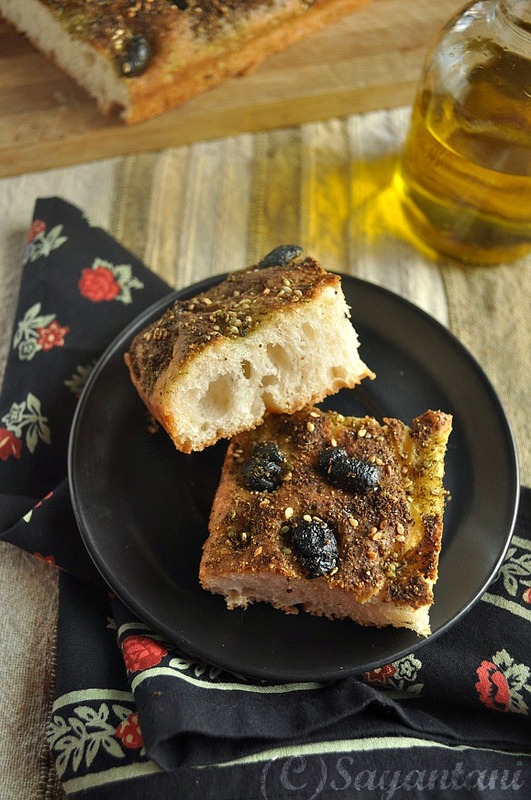 Focaccia is an Italian oven baked flat bread with large holes in it’s crumb and an airy, chewy texture. Mostly it is flattened by hand with uneven pockets on the top where good quality olive oil is poured to presrve the moisture to make it super soft. Varieties of toppings ranging from various vegetables, spices or deli meats could be added on the top to make it a meal in itself. 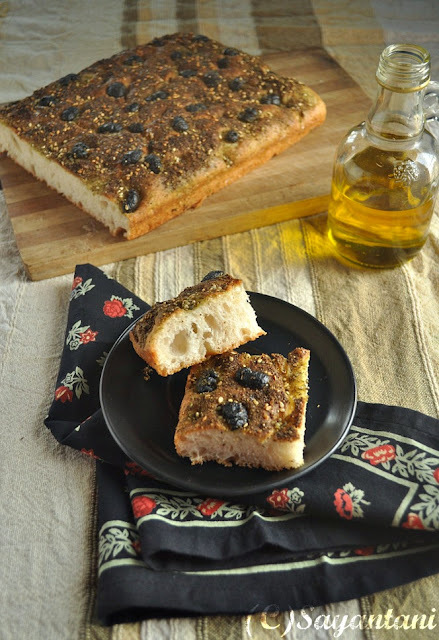 In our family we prefer a light airy focaccia with lots of tangy spicy za’atar on top. If you don’t have access to za’atar make it with any type of topping like fresh tomatoes, onion, lightly sauted garlic and capsicum etc. I have been folloing this recipe for the last 2 years and now I have forgotten from where I got it. With time I have improvised the recipe and have discovered ways that works best for me. I even have doubled the recipe with equally good result. Mix in the flour and ¼ tsp salt and put in a big bowl. Dissolve the sugar in the warm water and mix in the yeast. Stir with a wooden spoon and pour in the flour mixture. Mix thoroughly to get sticky dough. Oil your hands and the working surface with olive oil and start kneading it. Do not add any more flour as the texture of the final rise. Knead for 4 minutes then let the dough rest for 2 minutes. Again oil your palms and knead the dough for 5 minutes. Let the dough rest for a couple of minutes and finally knead it again for 2-3 minutes. Use up 2 tbsp oil in kneading the dough. Lightly oil the dough and place in a big oiled bowl. Cover with plastic wrap and let it rise in some warm place. I always place the bowl in my microwave (switched off). The dough will take 1-11/2 hours to double, so by the end of this time prepare a sheet or jelly roll pan (mine is 12X8) with generous amount of olive oil. Take out the dough on an oiled surface and gently start folding it on itself. Do not punch it down. Fold the dough at least 5-6 times and then transfer to the pan. Fold it once again and then start patting the dough to cover the entire surface of the pan. Poke few holes and pour the rest of the 2 tbsp olive oil on top. Gently place the halved black olives by pressing it on the surface. Sprinkle salt and za’atar on top. Loosely cover with a piece of oiled piece of foil and let it rise again. Within an hour it should again double in size. Bake in a preheated oven of 200 C for 18-22 minutes or till lightly browned on top. Cool for 5 minutes in the pan, cut and serve warm or at room temperature. wow, that looks super awesome !!! I am a big fan of any kind of Focaccia. 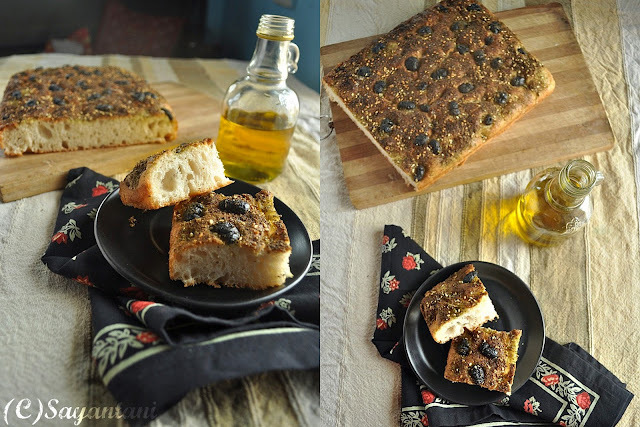 wow perfect italian bread...perfectly baked..n nice clicks! Wow! This looks truly delish! and Za'atar looks interesting! Focaccia is one of my favourite breads, yours looks so delicious. Wonderful bake, Sayantini..lovely crust and perfect texture. Need to get Za'atar soon. Omg, cant take my eyes from ur clicks..Za'tar focaccia looks mindblowing and super tempting. 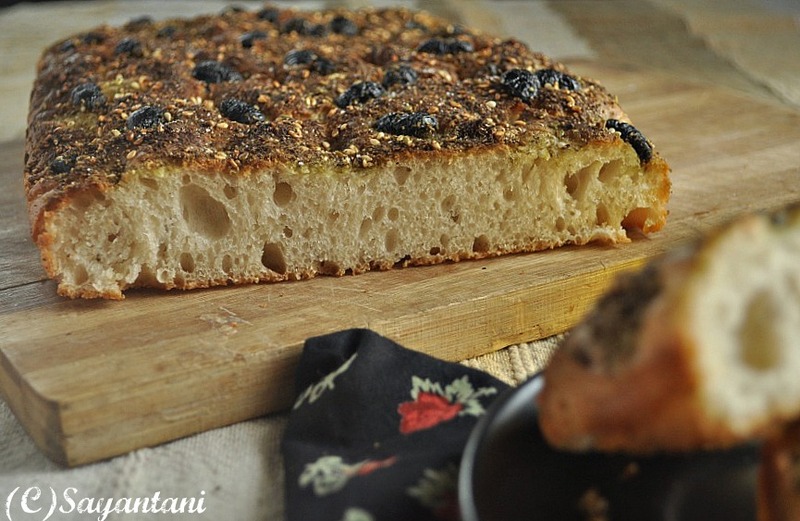 focaccia...yum....love this bread....the pics are really good. Can this be couriered :) ... U r a perfectionist and the bread is the proof. Absolutely luv it. 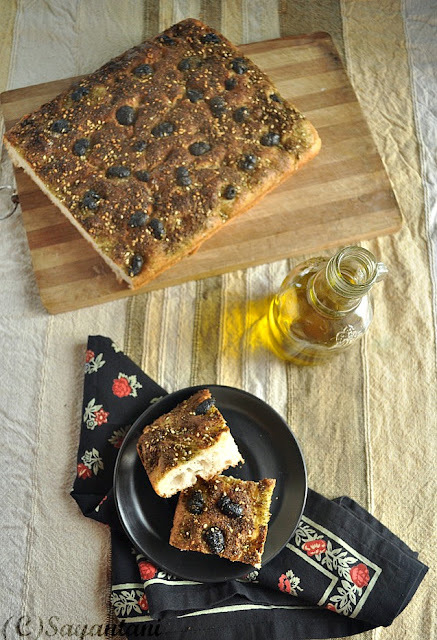 Zatar and focaccia .... just brought back my days in the Mideast,thanks to you.I am your newest follower,was really sweet of you to leave a note at my space. The pockets are created so neatly in the bread.. clearly says how perfect it must have tasted! Packing snacks and lunch for the kids is a challenge for me too. Breads are so very versatile and very handy. Your focaccia looks awesome with all those holes, bookmarked to try soon! zataar happens to my favorite spice for breads and pizza. The foccacia looks lovely. Awesome ! Looks perfect ! Your son is one lucky kid with such delicious stuff going into his lunch box ! !